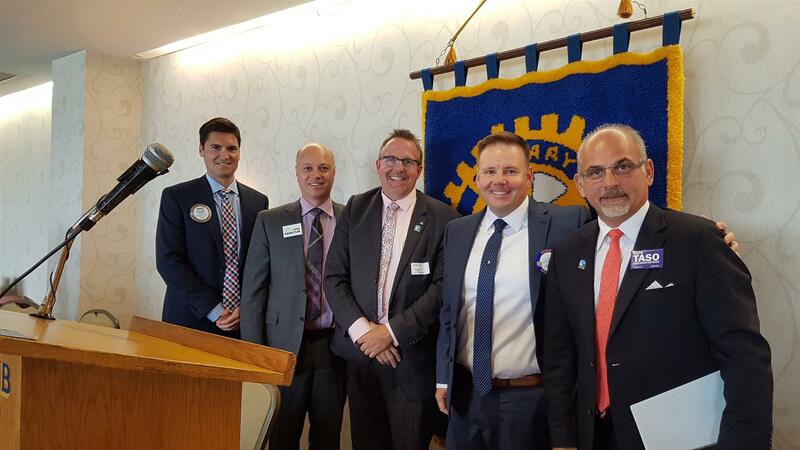 President Andrew Bandler was pleased to introduce each of the four Mayoral Candidates to the Club (L to R: President Andrew Bandler, Mitch Panciuk, Egerton Boyce, Jodie Jenkins and Mayor Taso Christopher). Names were drawn and candidates provided a short overview of their campaign focus. First up was Jodie Jenkins, elected to Belleville City Council in 2010, serving four years as Councillor, earning the reputation of a natural leader who will always stand up to fight for low taxes and the best course of action for the community. He believes in a common sense and measured approach to policy decisions affecting the city and has demonstrated his ability to work collaboratively with all levels of government. In the last two years, Jodie has been leading a team which is getting set to open Belleville's first emergency shelter for the homeless, a project called The Grace Inn. Jodie is a long-standing radio broadcaster in Eastern Ontario and was an on-air personality with Quinte Broadcasting early on in his career. He has spent the past 10 years with MBC Media and is currently the GM of Oldies 100.9 in Brighton. Jodie and his wife Shauna live in Belleville with their daughter Jacobie who is 4 and son, Jubal who is 2 and they are expecting their third child this coming March. Jodie's focus points include making life in the City of Belleville more affordable through a reasonable level of property taxes, open communication and transparency through strong listening, creating new jobs in an entrepreneurial culture, making our City a welcoming place to do business, to attract new investments and create employment opportunities, updating a 12 year City strategic plan and last, but not least, helping our most vulnerable to ensure no one gets left behind. Jodie has promised to get the job done. Taso Christopher was next up, elected Mayor for the City of Belleville in October 2014 after serving two terms as a Ward 2 Councillor. Taso was born and raised in Belleville and has been a resident of River Road in Corbyville for the past 25 years along with his wife Betty and their three daughters. Taso graduated from Quinte Secondary School and Humber College and has been an owner/partner of the local sporting goods retailer Four Seasons for more than 39 years. Taso served our community as a Ward 2 Councillor from 2006 - 2014 and has an in-depth knowledge of how the City operates as a municipality. In addition to his role on City Council, Taso has been the Chair of the Police Services Board, Co-Chaired the Belleville Waterfront and Ethnic Festival and has been a member of the City of Belleville Planning Committee, City of Belleville Audit Committee, Library Board, Eastern Ontario Mayors' Caucus and Ontario Small Urban Municipalities executive Committee, Director Veridian Connections. Taso has also been a member of the Greek Community Board of Directors, Chairman of the QHC Cancer Gala and President of the Quinte Ethnic Festival Council. Mayor Christopher is proud of the journey Council has travelled together these past four years. By investing in sound leadership, infrastructure and growth is positively driven. Belleville has competed on the world stage, in fact, Ontario needs more Bellevilles. Build Belleville includes twenty-two of twenty-two infrastructure projects that have been started or completed which is an outstanding accomplishment. Road, bridges, sidewalks, parks, splash pads, intersections, new City centre......all of these will drive economic development. We have an all time low unemployment rate. Six hundred acres of developmental land. Staff, Council and stakeholders have a robust plan that will continue to grow the city. Belleville is one of 3 cities in Ontario with professional hockey. The 2018 Municipal Election is about the people and their families, their futures and making a leadership decision for the next four years to continue projects and take on new ones. Please feel free to contact Mayor Christopher with suggestions, comments or concerns. Third to the podium, Mitch Panciuk has a long history of community service, most recently as a City Councillor since 2014. He is a former President of the Belleville Chamber of Commerce and Chair of the Quinte Economic Development Commission and many other organizations. Mitch Panciuk serves as Chair of the Grant Committee, Chair of the Community Arts and Culture Fund, Chair of the Traffic Committee, has been a Board Member of Quinte Conservation and the Belleville Downtown Improvement Association and also a member of the City's Audit Committee, Active Transportation Committee and Cultural Exchange Committee. Mitch and his family moved to Belleville to open the local Boston Pizza franchise in 2001. He and his wife Lisa have built a thriving business, raised their three daughters, walked their dog Cooper (a lot) and fallen completely in love with Belleville, where they expect to live the rest of their lives. Mitch presented in brief his vision for a Safe, Responsible Growth Plan with eight key components -- taking concrete action in dealing with our housing crisis, making a healthier community, including everyone in our community investments and high-speed for all, making Belleville the safest city in Ontario, increasing green and recreational space, improving customer service, an open government you can trust and paying for it! Mitch believes in partnerships and is not one to make empty promises. Imagine a better Belleville by working together. That's what he wants to do. And last, but by no means least, President Andrew introduced Egerton Boyce, a lifetime resident of Belleville. Upon completion of high school, Egerton attended Loyalist College where he graduated in the Law and Security Program specializing in Police Sciences and Corrections. Since that time, he has been working at various youth correctional facilities where he spends time providing youth with a positive role model along with teaching programs such as anger management, conflict resolution, group dynamics and problem solving. Politics has always been in his blood since he was a teenager when he spent after school hours working at George Zegouras' grocery store. Egerton's father, Gerry Boyce, was also a local city councillor during the 80's and early 90's. First elected as Councillor in 2003, Egerton has participated in or chaired most committees including Business and Retention, audit committee, social services, emergency medical services, graffiti task force, green team, conservation, Active transportation, emergency operations to name just a few. He's an avid kayaker, mountain climber. Last year he received the provincial 10 year volunteer award for his local work on Christmas Sharing and has participated for many years in the sleep out program behind City Hall. Egerton believes his leadership training and experience as well as his non adversarial, respectful positive approach to politics is important. His motto is Positive Politics. Egerton shared his initiatives -- active transportation for multi-purpose and bicycle lanes, traffic calming and making our street safer for all, affordable housing to increase available housing to accommodate growth, expand the doctor recruitment search to include specialty doctors and nurse practitioners, ensure the arts receive adequate funding, continue green programs and ensure all city-owned buildings maximize energy savings, establish a multi-year strategic waterfront plan working with private and public partnerships. Egerton is focused on bringing together people with varying personalities and creating an environment where each person will be respected and listened to regardless of how long they've been on council. The upcoming council will be a "we" council, providing leadership that is not divisive. The presentations were followed by a short question and answer period.